Had some interesting situations in the past little while that may be helpful for those with questions about watering. "Water? I never watered them, I let nature take care of them." Well, sure enough, nature took care of them alright. I figure that it cost her about $2,000 for the trees and I cannot comprehend how on earth someone could spend that much and never water that investment. This is a true story. 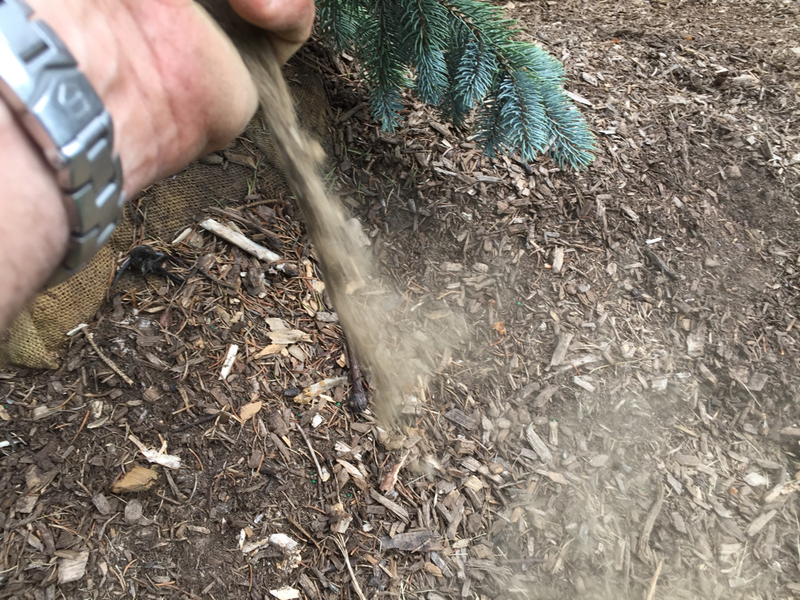 Three weeks in June with zero rain, and 17 weeks in summer/fall with full sun, high temps, wind, clear skies and zero rain with the drought continuing into last winter, and she never considered that those great old hemlocks might need to be watered. 2. ~$600 specimen magnolia planted by us last year dead this spring when all of ours look great. When asked how he went about watering that tree he said he had a lawn irrigation system and accordingly he didn't need to water that magnolia. He never watered it once. Lawn roots are 3" down. That magnolia root ball was about 18" deep. Trees have different requirements than lawns. As that tree crinkled and shriveled last summer, someone might have/should have noticed. Not much an expert like myself can do after the tree has been reduced to kindling sticks. "with all this rain this spring, I haven't watered at all. Plus my hose doesn't reach and I was away." I told him "all the rain" he was referring to was three or four weeks before, like in April and now its June and those trees are clinging to life, better go water them. I then showed him how to tell if the rootball is dry or wet. Good thing that he came by so soon because I was at his house and they look GREAT! 4. A family bought a huge hemlock from us and had us plant it for their mother in Trumbull. We heard back from the family seven months later that the tree was dead. I went back to find the characteristic no needles left on tree sign of complete neglect and dessication. I asked my question about how they went about watering and they said they don't live there, that they didn't water it, and their mother was too old to do the watering. They wanted me to replace the tree at my expense, and of course my reaction was not liked by them- it was an extremely unpleasant scene for me. My job is to provide to people the best trees I can provide and after our truck leaves the driveway, it's their job to take care of the trees. If the purchaser has questions about follow up care, I hope they ask because we do a really really great job education customers, and spend A LOT of time doing just that. Bone jarring, plant killing, totally neglected soil moisture. You waited way too long to check/ lighter color, drifts away in the breeze. Death has started on some plant parts. 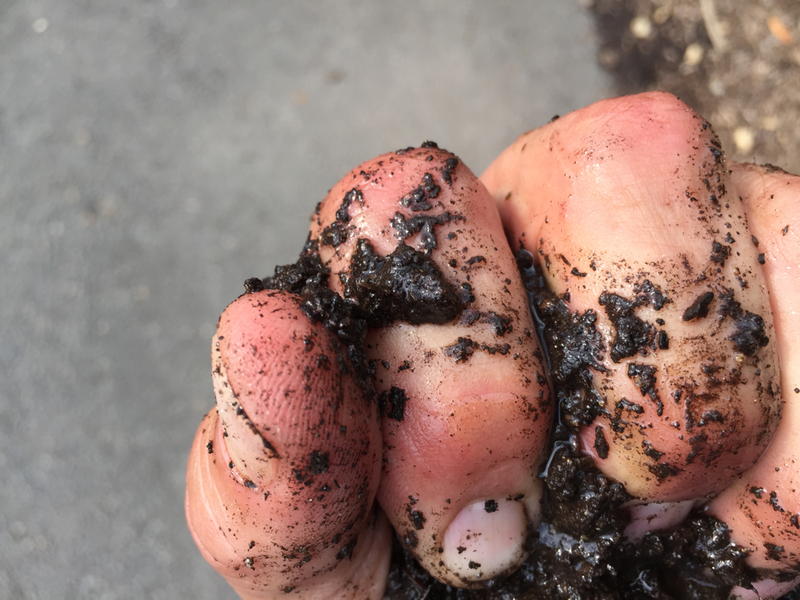 SWAMP SOIL: WAY TOO WET- KILLS PLANTS: Water goes between fingers when soil is squeezed. I named this "FREE WATER." When its like this, you are loving your plant to death by watering too much. Squeezed soil wrings water easily like a sponge. Free water. Don't water new plants with an irrigation system!!! Don't water every day (rare conditions call for this but not with free water in soil)! 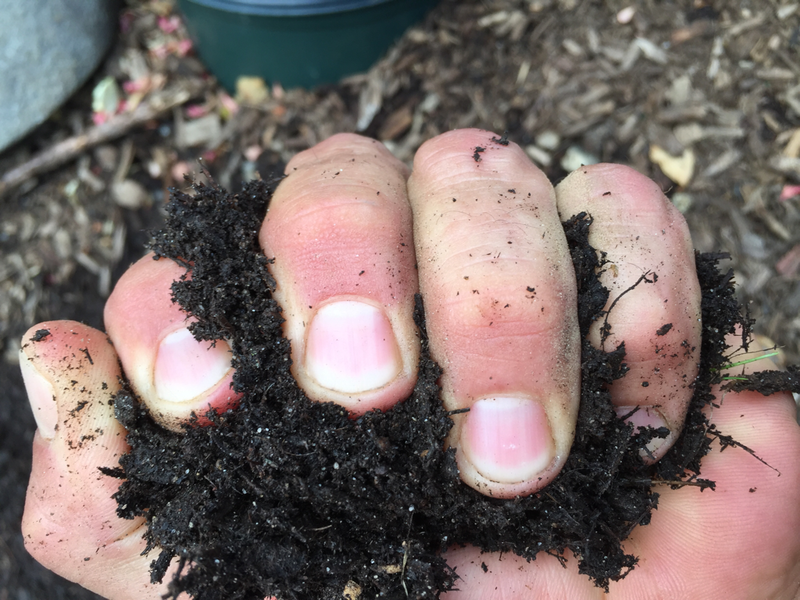 PERFECT SOIL: rich and dark in color but squeeze like hell and no free water! If the surrounding soil looks like this you might not have to water. "WHEN THEY NEED TO BE WATERED." This is a concept that shouldn't be too hard to understand but a lot of people cannot grasp and that lack of understanding results in a lot of plant suffering/ and guess who almost always gets blamed for it? "water new plants when they need to be watered." Sun, wind, clouds, temperature, the kind of plant and the soil it came with as well as the soil type in the ground it's planted in all gather forces to create the schedule for YOU to determine if the plant needs water or not. 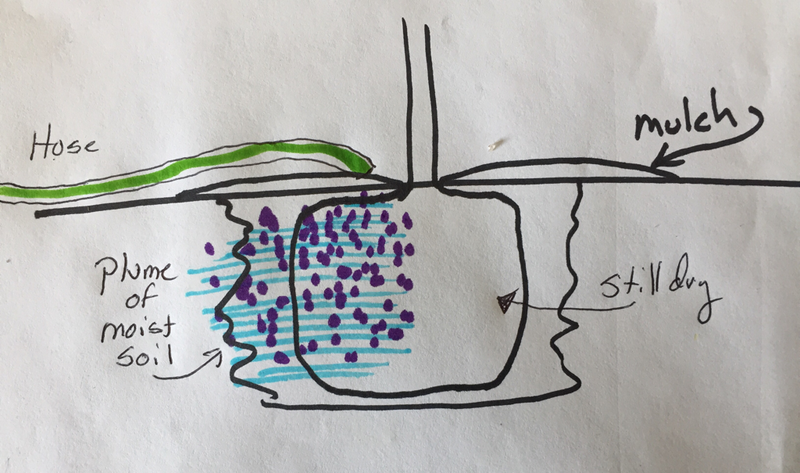 When fleshy plants lose water the cells lose stiffness and they droop at the tips first (farthest away from the roots) and the suffering works it's way towards the stems as the dessication proceeds from mild to severe. When you notice the droopy look and finally water it the plant becomes more turgid and straightens back up again if you caught it in time. If you didn't, the tips will become tan and crispy when rolled in the palm of your hand. and that tissue will never come back but subsequent foliage should grow past the damage and it will all be forgotten. Unseen roots suffer the same way so their efficiency is reduced. Woody plants (like a pink dogwood) will not droop for you to notice so easily. Instead, their leaves will suffer the crinkly fate and there might be a few years before the tree looks normal again. Catching up to a hydrated soil ball takes a LONG TIME and overcorrecting can cause a new set of issues. When a plant is overwatered (either by giving too much each time, watering too frequently, or watering too much in a poorly drained soil) the root tips die so the root can't ironically take up water so the plant looks like it needs to be watered. Overwatered tissue usually looks darker than underwatered tissue with the leaves not crinkly. "BUT I HAVE AN IRRIGATION SYSTEM!" This is the root of all evil. Kinda like propping your child in front of the TV and going out for the night. When people have an irrigation system, they don't know their plants. Their system is taking care of the plants, so they don't have to. When they don't have to, they don't. So plants scream out with their symptoms but there is nobody there to hear them. You have to get to know your plants the first year, then you can ignore the watering issue unless its drought time. Then they come back to the nursery where we easily see that the plant was standing in water or looks like it was never watered, always a very uncomfortable conversation because the plant death had absolutely nothing to do with the health of the plant at the time of the purchase. That's when we hear "but I have an irrigation system!" You have to protect your kids as well as your new plants by getting to know them. 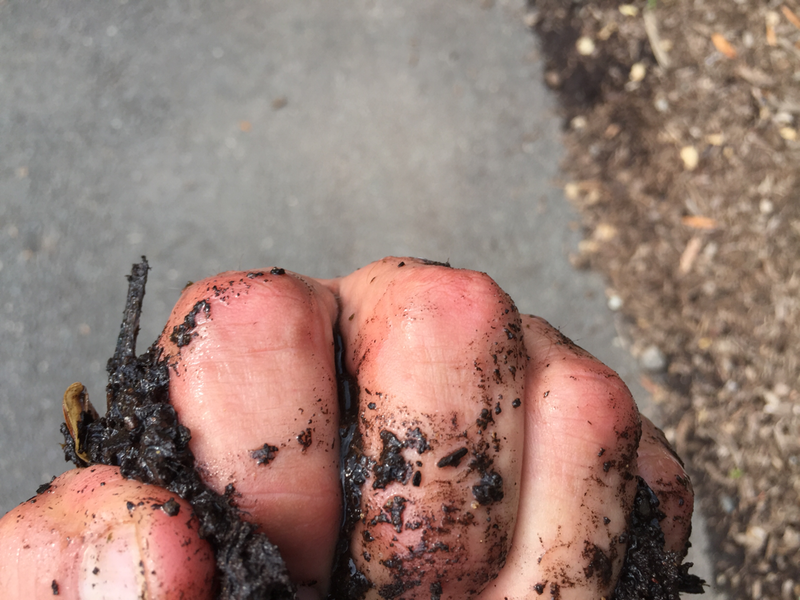 Walk over to that tree you just planted, get on your knees, move the mulch aside and push your thumb against the root ball to see if it's squishy or rock hard. If it's rock hard it means its dry as a bone and you waited way too long to check it. If its squishy that's better but not to the point of having "free water" which is a term I coined years ago. Free water in the soil is water that is excess like a wet kitchen sponge. Squeeze the soil and water comes out between your fingers. This kind of soil moisture kills plants, even plants that like wet soils. The perfect soil moisture is like a damp kitchen sponge. Squeeze it and no water comes out between your fingers. Roots have air AND water. 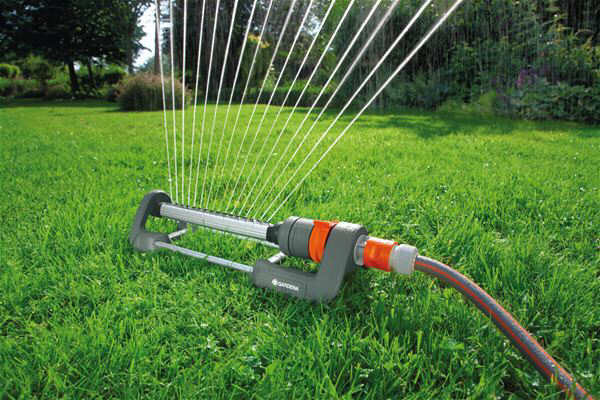 DO NOT water with this type of sprinkler! Almost no water comes out of the teeny holes. Great for kids to run through, not good enough for plants/trees. Best way to water larger trees is not to stand there. Place hose at base of tree, turn faucet so it trickles, and leave it there for the appropriate amount of time. Frequency determined by the plant's needs and weather conditions. PLEASE NOTE: We work hard to take care of our plants here and once the live plant materials are at your house, then it's your turn. We do not guarantee our plant material because we have no control over plant care once it is no longer in our possession.